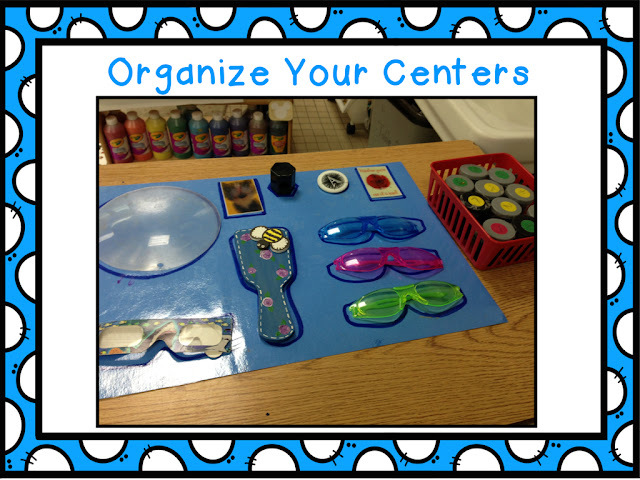 So happy to have Palma from KFundamentals guest blogging about Classroom Organization today! Please give her a warm welcome and don’t forget to show her some love on FB, Pinterest, Twitter, Instagram, or on her TPT store! I’m so excited to be guest-blogging today here on Kindergarten Chaos! I have some great tips, project ideas, and even a FREEBIE for you! Click the image to see my 5 Senses Writing Pack. Outline all of the little parts at your centers on construction paper. Laminate it and your centers will stay organized and you will know immediately if any pieces are missing. 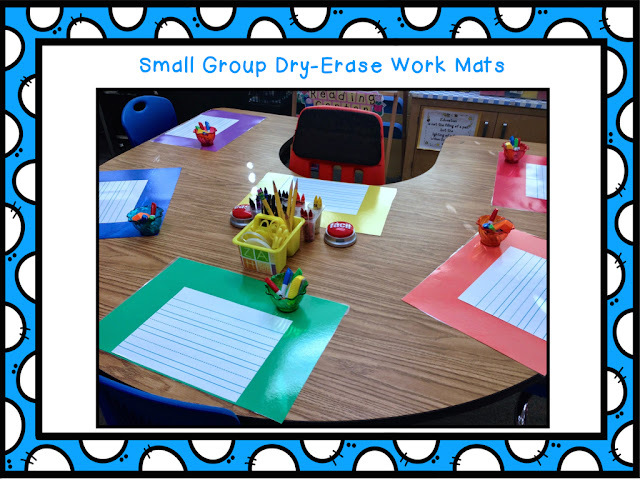 Students can practice writing letters, numbers, their name, sight words, etc. Or write a word or phrase to help complete their monthly writing page. Click the image to see my Monthly Writing Pages. Attach lined dry-erase contact paper to a piece of laminated construction paper. Add a strip of numbers or a set of alphabet letters to the top. Add dry-erase pens & small erasers and you’re done. Click the image to grab my FREE Color Word Project. Cover your easel with a flannel-backed plastic tablecloth. It can be washed or tossed when it gets covered with paint. Tired of washing paint brushes? Each night, cover your paints with wet sponges that have a hole poked in the center for the brush handles. The moisture will evaporate, but your paints will stay fresh and won’t dry out. Place paint sample cards on a shelf and place matching bottles of paint just above each paint sample card. Just a glance, and you will know which color you’re out of. Place a plastic sandwich bag inside each paint cup before filling with paint. They are easy to discard and your paint cups will stay clean. Add a little petroleum jelly to the plastic tops to help make clean-up easier. Click the image to view my “When I Grow Up” Writing & bulletin board idea. 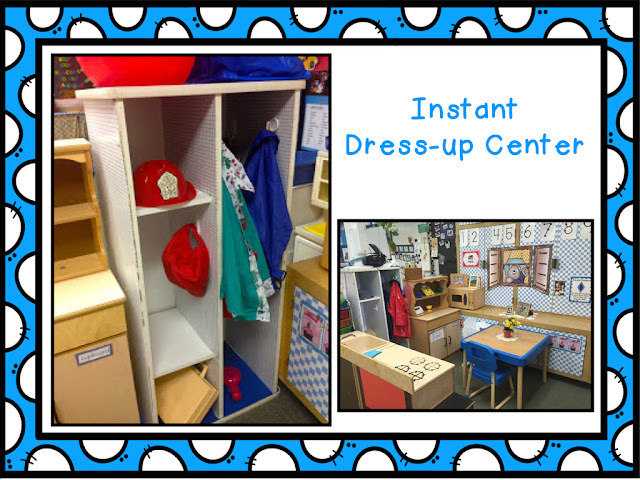 Turn a low, horizontal bookcase into a dress-up center by turning it on its side! Add some stick-on hooks and you are ready to add some costumes, hats, and accessories. Click the image to grab my color writing pack. Six Regular or 4 Jumbo crayons fit nicely in these 8-part popsicle molds. 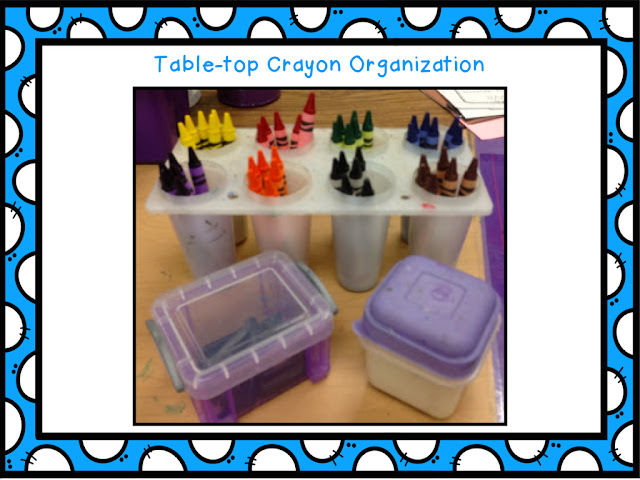 Place this in the middle of your tables and it will eliminated so many problems while encouraging sorting skills! for allowing me to guest blog here today! Great ideas. I like the sponges on the paint. I hope to have a painting station this year. Hi Candice and thanks for stopping by! 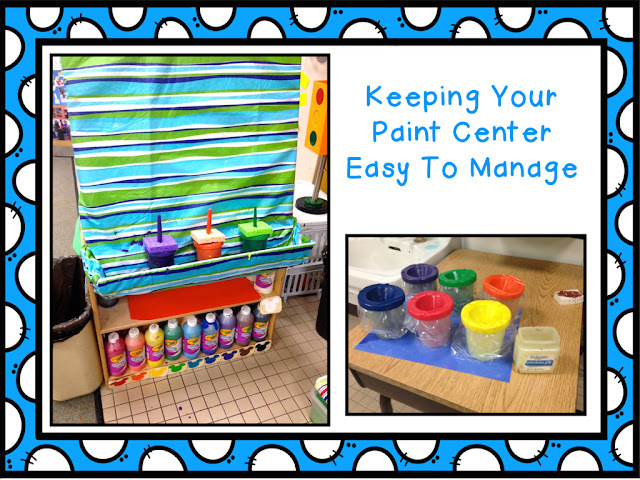 I use paint in my art center and my kids love it! !